Holywell cemetery, in the heart of Oxford, is a picturesque, tranquil urban cemetery that dates from the mid nineteenth century and is managed for wildlife. This cemetery was a pioneering site for urban nature conservation, and one that OCV have worked at since the early 1980s. Parts of the cemetery are left to scrub over and are then periodically cleared, leaving plenty of diverse habitats for wildlife, whilst still allowing public access. OCV tasks at this site include managing invasive plants and shrubs to allow access to the public and wildlife, to preserve the historic gravestones, and to encourage a diversity of wildlife at the site. Pheasants are known to nest in Holywell cemetery, whilst many other species of birds, butterflies and small mammals also live in the grounds. Muntjac deer and foxes are known to regularly visit the site. Trees and flora at the site include magnolia, yew, holly, ivy and brambles to name just a few. Management of the site is undertaken by BBOWT, The Friends of Holywell Cemetery and OCV and includes controlling invasive species such as ivy, holly, bramble and unwanted saplings that can otherwise make paths impassable to both humans and wildlife. Ivy is also removed from the tomb stones to help preserve the historic elements of the site. OCV have worked at this site once or twice a year for over 25 years. Another task carried out by OCV at Holywell Cemetery has been repairing of the wall using traditional lime mortar to match the original, and using the original stone. Lime mortar has been used in building work for centuries and has very different properties to modern cement, and is still considered superior in some respects. There was a well situated just outside the city walls of Oxford that the people at the time referred to as the �Holy Well� as the water from it was thought to have special properties. In the 11th century, a church and a manor house (which later became a workhouse) were constructed near the well. In the mid nineteenth century, the graveyards of the six parishes in central Oxford became full, at least in part due to cholera epidemics. Merton College made some land available behind St Cross Church and in 1847 the Holywell cemetery was created. Notable graves at the site includes those of Kenneth Grahame who wrote 'Wind in the Willows', William Wallace the Scottish philosopher and Walter Pater the Victorian essayist and critic. When the space available for new burials diminished, the revenues for upkeep of the site also dwindled, causing the site to become overgrown and derelict. �The Friends of Holywell Cemetery� then started a renovation and conservation programme for the site, with the emphasis on making the area accessible, whilst also creating a wildlife haven. The volunteers raise money and perform conservation work, sometimes calling in the OCV for added assistance. Holywell cemetery is located to the east of central Oxford. Head north onto Longwall Street from the Magdalen Bridge end of the High Street in Oxford. As Longwall Street bends left to join Holywell Street, take a right to join St Cross Road. 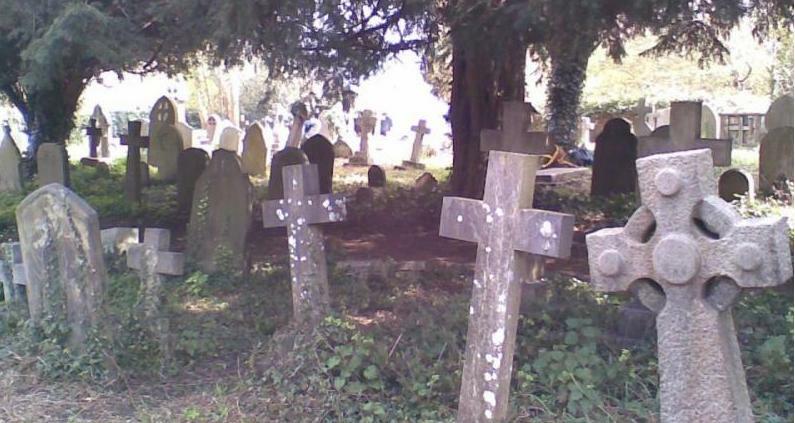 The cemetery is behind the church in St Cross Road.